The Precipice Alliance, a non-profit organization dedicated to promoting awareness about global warming through the visual arts, has commissioned its first work, which opened in Jersey City, Nov. 1, 2006. 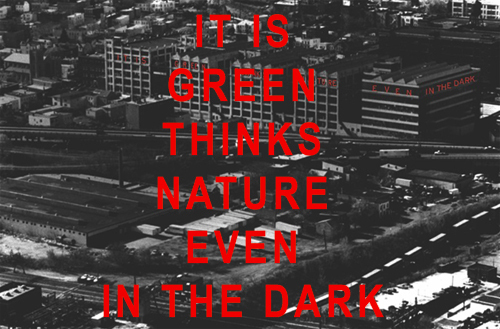 The piece, by New York-based conceptual artist Mary Ellen Carroll, consists of a 900-foot-long window display in the buildings of the former American Can factory, comprised of eight-foot-tall neon letters proclaiming, "IT IS GREEN THINKS NATURE EVEN IN THE DARK." The head-scratching phrase is meant as an exercise in "indestructible language," focusing on the fluid, open-ended nature of words (strange, for a project with a clear social message! ), and is sure to cause some confusion along the Pulaski Skyway, the New Jersey Turnpike, and in planes flying into or out of Newark airport. Though using illuminated letters to get the word out, the organization hastens to note that the art piece is "carbon neutral," employing low-wattage transformers and lead-free glass tubing, as well as using solar panels to offset the energy consumed. An event will take place at the site Nov. 13, 2006, to celebrate the debut of the work, featuring songstress Joan Osborne and a lecture by New York Times environmental reporter Andrew C. Revkin. For info, check out http://precipice-alliance.org. The Precipice Alliance was co-founded by Joel Sternfeld and Donna Wingate; Robert Hammond is on the Board of Directors. The mission of the Precipice Alliance is to increase awareness of the global effects of climate change. To do so, the Alliance will fund high-profile, innovative public artworks that address this urgent matter, while simultaneously functioning as an educational and informational forum. Visibility is key to positive action on this issue. Artists can give form to the intangible and deliver a powerful message about the need to meet the critical challenges of global warming. Commissioning projects that specifically address climate change will direct public attention to the urgency of the issue. To this end, large-scale contemporary art will be executed in public venues, with each artwork aligned with a specific environmental initiative and related public response. These educational and action-oriented initiatives will serve to inform, to provoke thought, and to instigate profound change.